It's been several months, so refresh your memory here on where I left off. 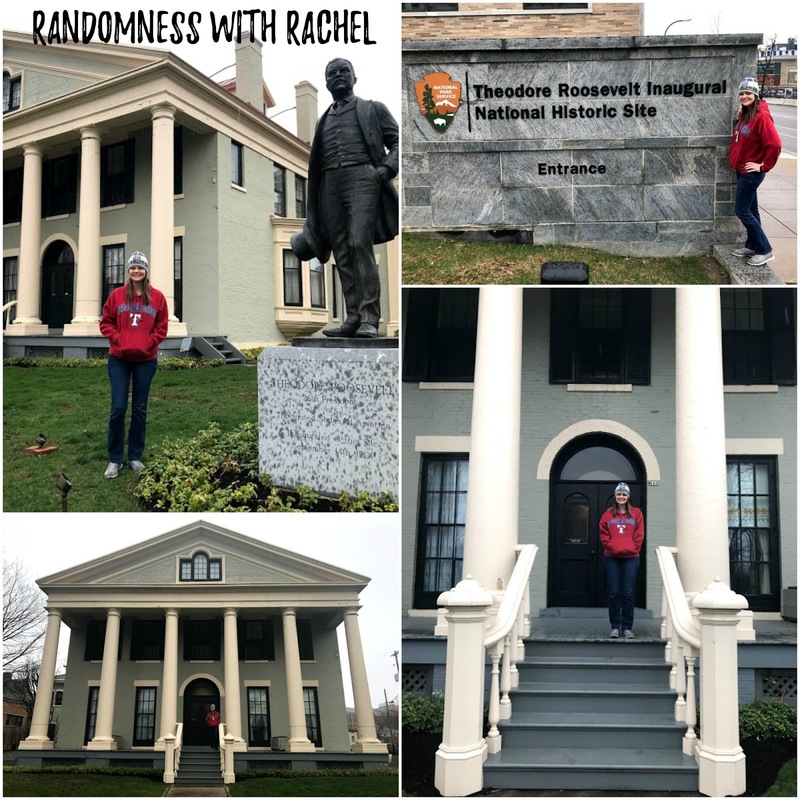 On our way from Pittsburgh to Toronto, we had a stop in Buffalo, NY on our itinerary solely because I wanted to stop at the Theodore Roosevelt Inaugural National Historic Site. Yes, I'm a nerd. On our way into town, we passed by a baseball stadium. 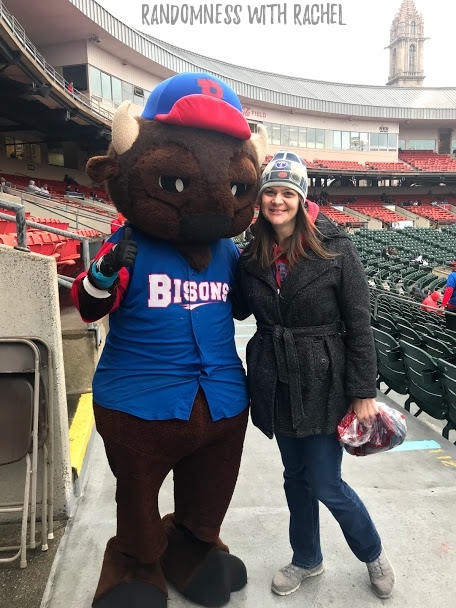 After some research, we discovered it was a minor league team called the Buffalo Bisons (and we both thought it was a great name). We decided we wanted to swing by and get a T-shirt on our way out of town. But first, we made a quick stop at the home where Teddy Roosevelt took the oath of president after the assassination of William McKinley (because I'm a history nerd and will stop at any place that has some historical reference). 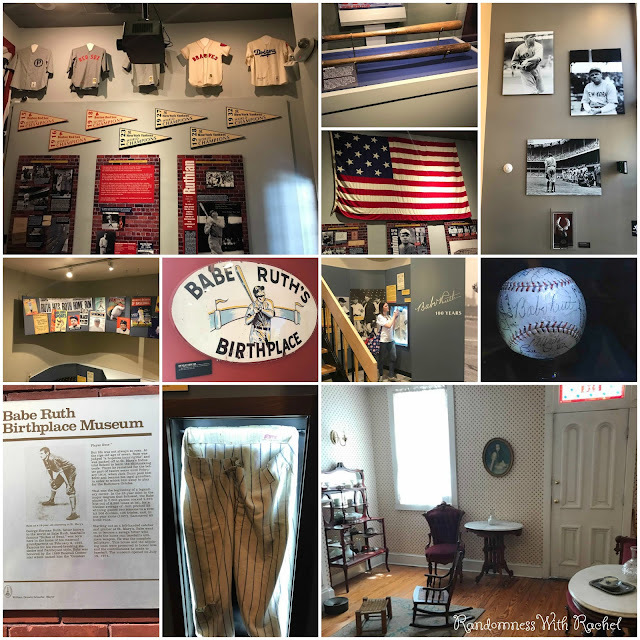 Unfortunately they only allowed guided tours in the home, and it was a 90 minute wait for the next tour, so we just took a look around the outside of the house. 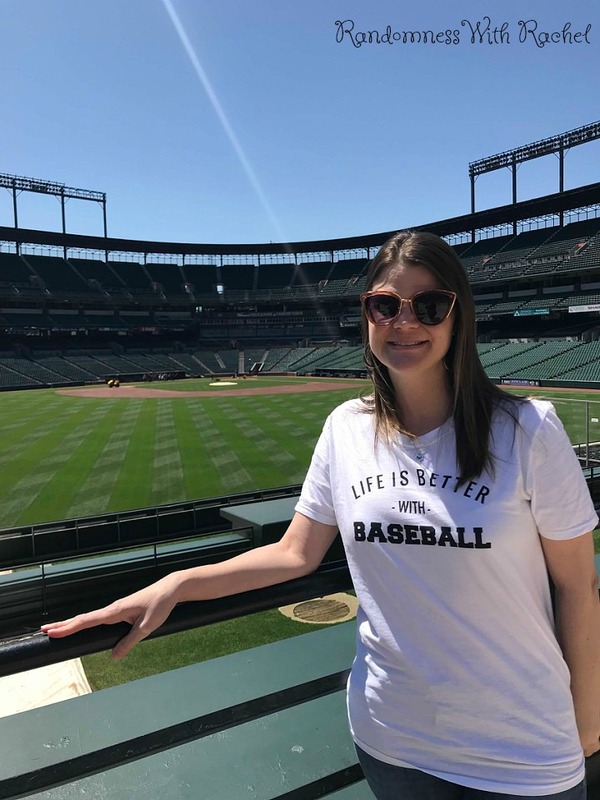 We had to look up the address of the Bison's ballpark, and when we did, we discovered that they had a home game that day. A day home game. And it had just started. Mind you, it was 37 degrees and drizzling, but we HAD to go. We were on a baseball road trip after all. We purchased cheap seat tickets and made our way through the gate. We were in luck- it was free ice cream day! It doesn't matter how cold it is-I will always take free ice cream. After a quick stop at the gift shop, we made our way to our seats. Well, actually our seats were in the far corner of right field (meaning they were getting drizzled on). A nice usher said we could sit under the covered seating area. We overheard a conversation in the gift shop that only 94 fans were braving the cold weather that day so there were plenty of seats. 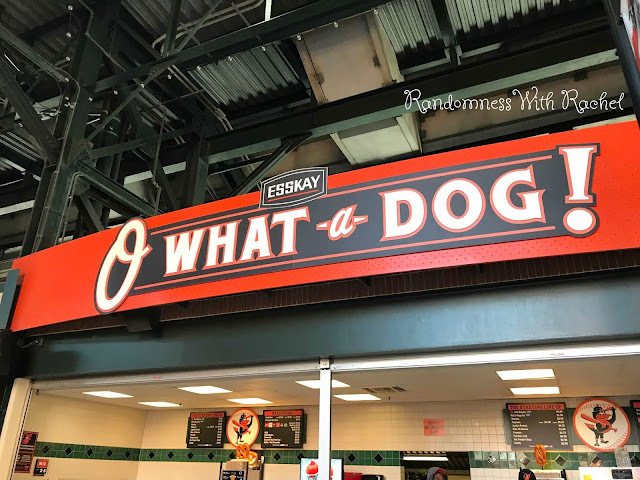 In the gift shop we noticed they had stuffed celery toys, but we were so confused why (we later found out it was a mascot that used to race in between innings, he is now retired). 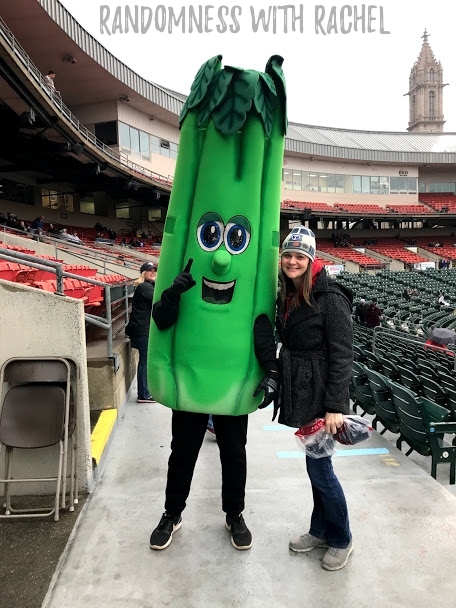 Anyways, we hadn't been sitting long when Lisa grabbed my arm and screamed "it's the Celery!" And of course we needed to get a photo with him. We also got one with the official mascot- Buster the Bison. 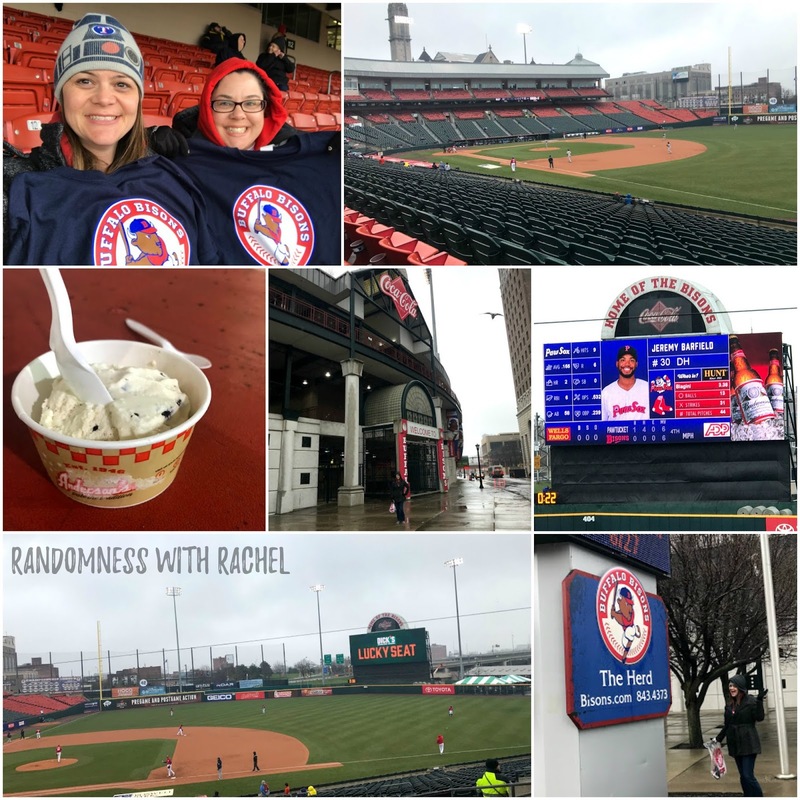 We became fast fans of the Bisons. And I have to give credit to the fans that were braving the weather- they were passionate. We left in about the 7th inning. 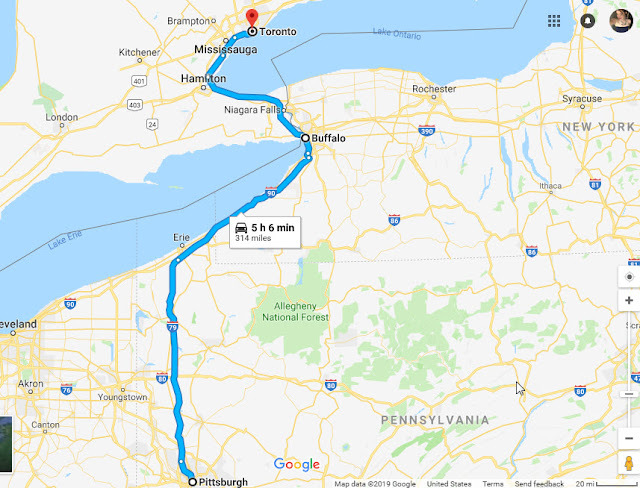 We were supposed to go to Niagara Falls and we were already leaving Buffalo way later than we had planned. Since the weather wasn't exactly perfect for viewing the Falls, we didn't mind much that we had a detour. Niagara Falls is one of those places that I've always wanted to visit. It's something that I've always seen in books and on TV and just wanted to see it in person. I definitely want to go back when the weather is nicer, I would like to take one of the boat tours. The day we were there was NOT a day I wanted to be on a boat right under the falls. It was dreary and cold. It even started to snow at one point while we were there. I will say that the Falls were a wonder to see. SOMEONE took one look at them and said "it's just water", but I won't name names. :) We were able to see Niagara Falls from both the New York side and Canada side. If you go visit, I highly recommend going to the Canada side. 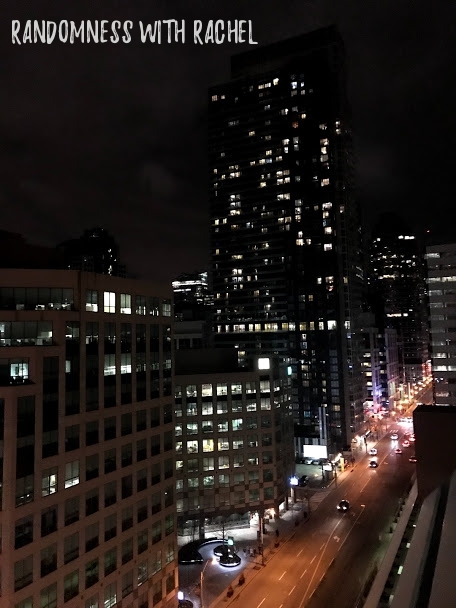 After a quick dinner stop, we made our way to Toronto, which was less than two hours from Niagara Falls. After several late nights, it was nice to get to the AirBnb somewhat "early" and just have a relaxing evening. 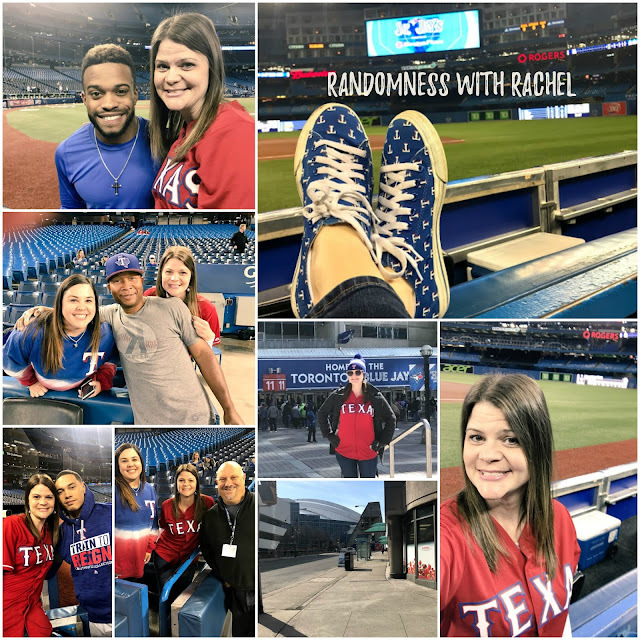 The next day we made the short one block walk from our AirBnb to Rogers Centre to see the Rangers take on the Blue Jays. 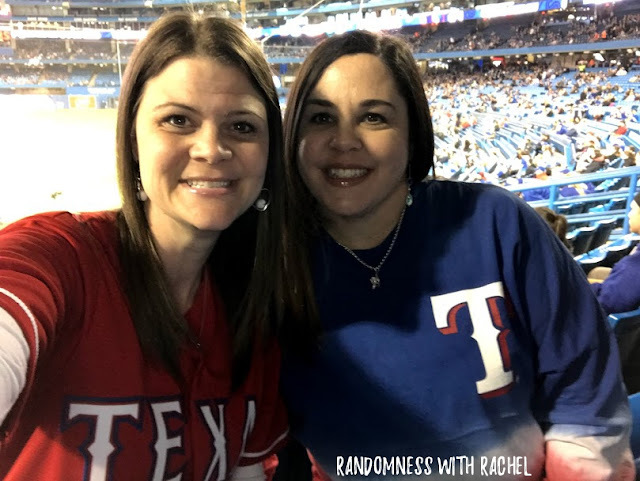 We lucked out and saw the Rangers twice on our road trip. There was no batting practice because it was a day game, but we were able to get photos with several Rangers players as well as the third base coach Tony Beasley. We also met Evan Grant, a beat writer for the Rangers. The game wasn't that good (because we didn't win), but we still had fun. 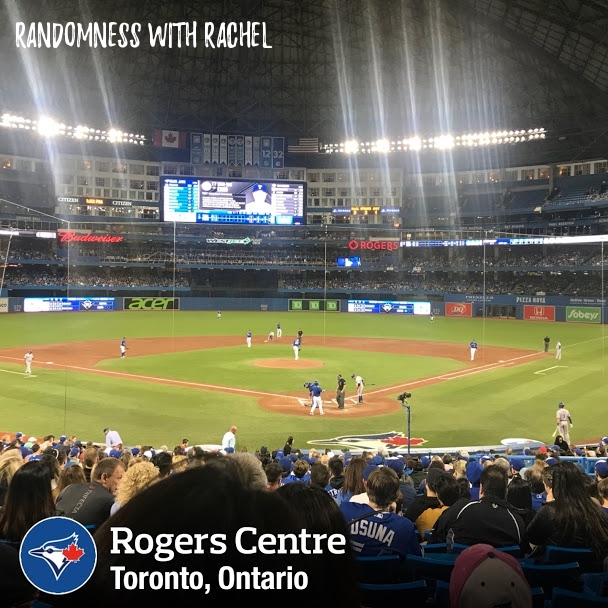 We were told that Rogers Centre wasn't going to be that great, but I actually thought it wasn't that bad. Everyone was so nice. 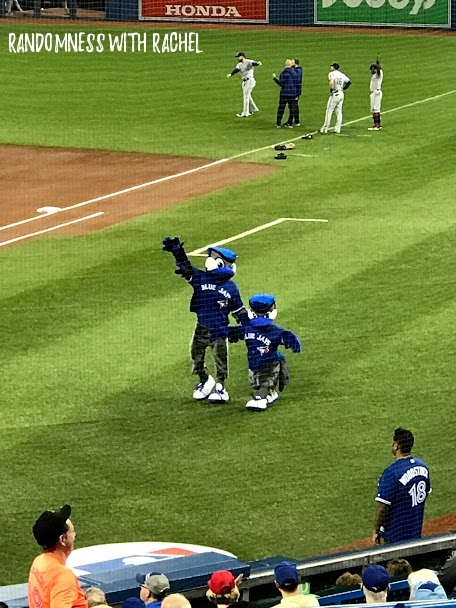 The Blue Jays mascot and his sidekick were a little creepy looking, but overall, we enjoyed our visit there. A friend spotted us on TV! 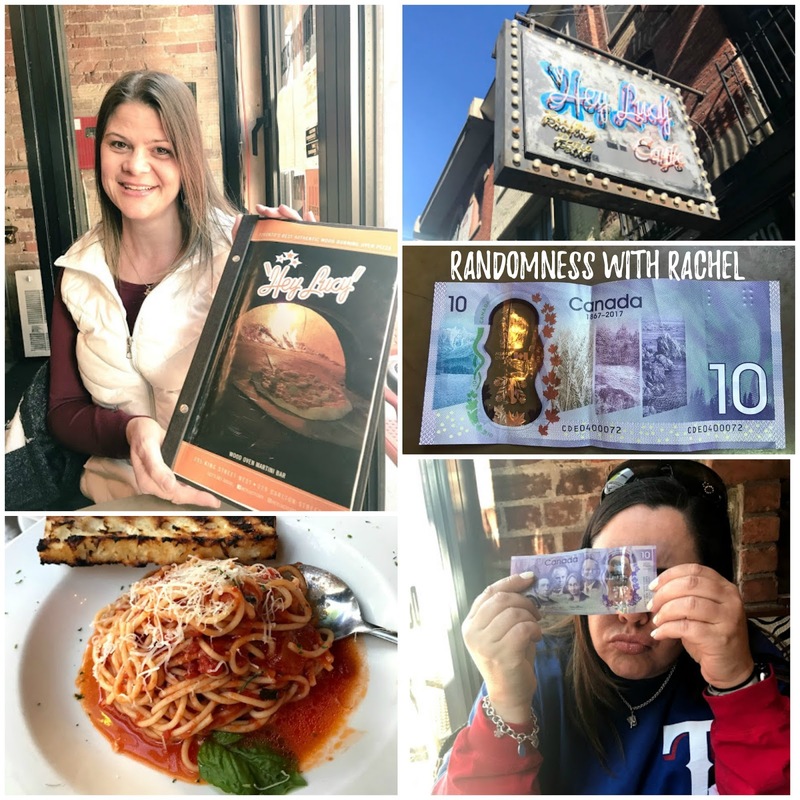 After the game, we ate at a wonderful Italian restaurant called Hey Lucy! (it was a recommendation from someone I follow on Twitter who is from Toronto). Fun fact. In Canada the meal portions are a lot smaller than in the US. Also fun fact: Canadian money has a clear portion you can see through. 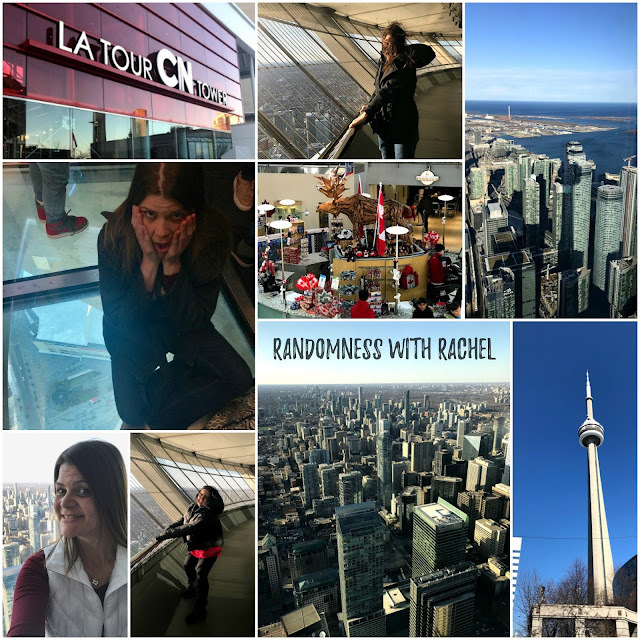 Later that evening, I faced my fear of heights and we went up in the CN Tower. I will admit that the view was spectacular. I was even brave and sat on the "glass bottom" and was doing fine until some kid started jumping up and down on it. 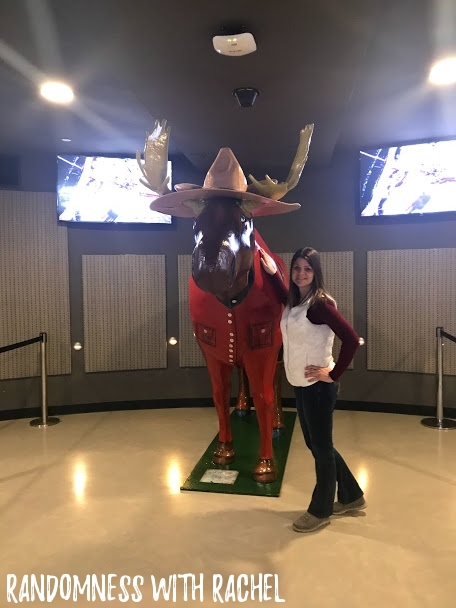 Sadly this is the only "Mounty" I saw because The Royal Canadian Mounted Police doesn't police in Ontario. We left early the next morning to make the drive to Detroit. My visit to Canada was short and I hope to spend more time and do more sightseeing on my next visit. Yeah, I know, it's been four months between updates. I'm horrible. I'm STILL recapping a trip I took in April. Okay, time to get back on board this blog train and start posting again. I'm not even gonna make any excuses. Just bear with me. Maybe I'll get another post up this week, maybe it will take me another four months. Who knows? But, for now, enjoy day two of the awesome road trip I took with my friend Lisa earlier this year. :) It's been four months, so if you want a recap of day one, go here. Despite a late night the night before, we were up bright and early and were on the road by 7am the next day. We had tickets for a tour of PNC Park at 3:45 that afternoon, so we were sort of on a time limit to make the drive from Baltimore to Pittsburgh. We did have a few planned stops along the way, so we made sure we started the day early. Our first quick stop was in West Virginia in the town of Berkeley Springs. 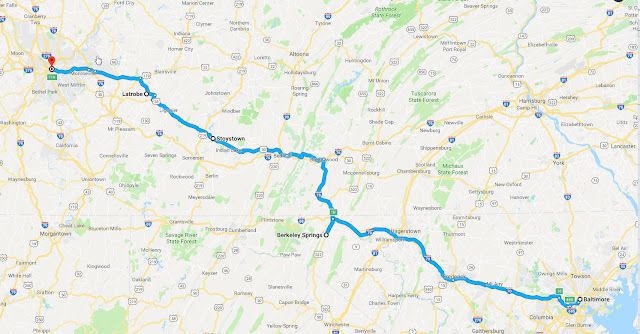 The only reason for this stop was so I could cross West Virginia off my states to visit list. Yup, we took a fifteen minute detour just so I could get THIS photo. The "Welcome to West Virginia" sign was not in a place where we could stop and take a photo. A little further down the road, we saw this sign, and it was good enough for me. It had WV on it, that's all I needed. We were back on the road and took a slight detour to the town of Stoystown, PA. 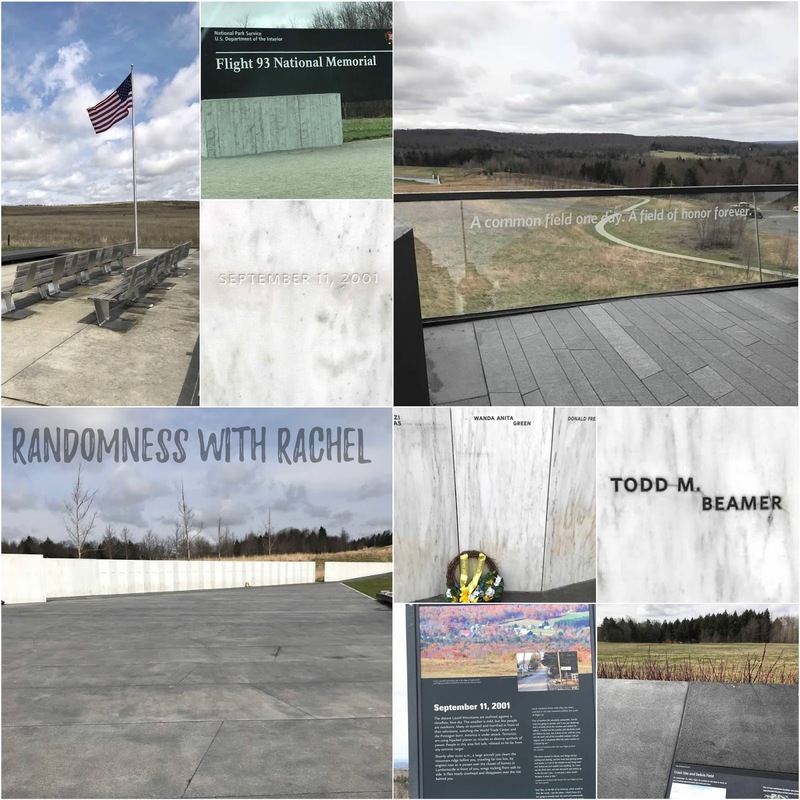 This is where the Flight 93 Memorial is located. I wanted to pay my respects to those who lost their lives on 9/11. The memorial was very somber but respectful. The Visitor's Center was closed, but we did walk down the path to the Memorial Plaza at Crash Site and took time to read the Wall of Names. There were flowers and wreaths by some of the names. 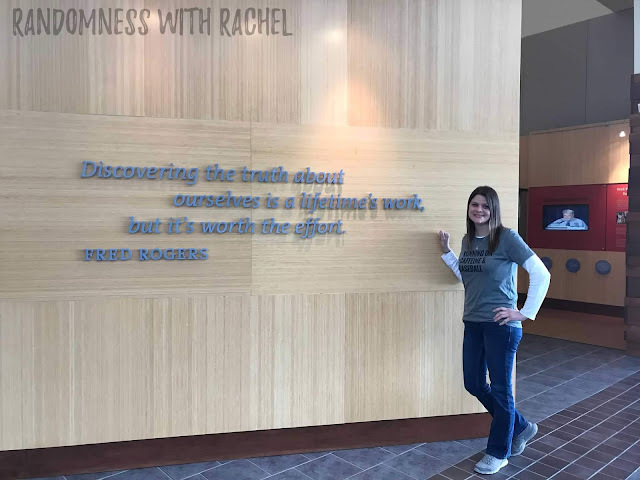 To me, it was a very moving experience to be there. It was hard to walk through with dry eyes. 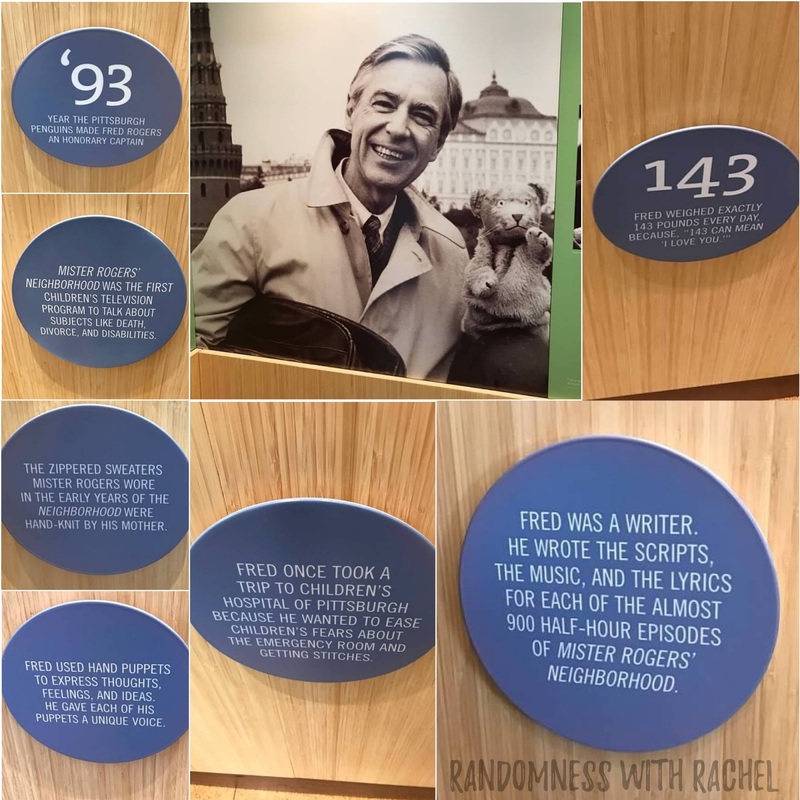 Our next stop was in Latrobe, PA, which was the hometown of Mister Rogers. 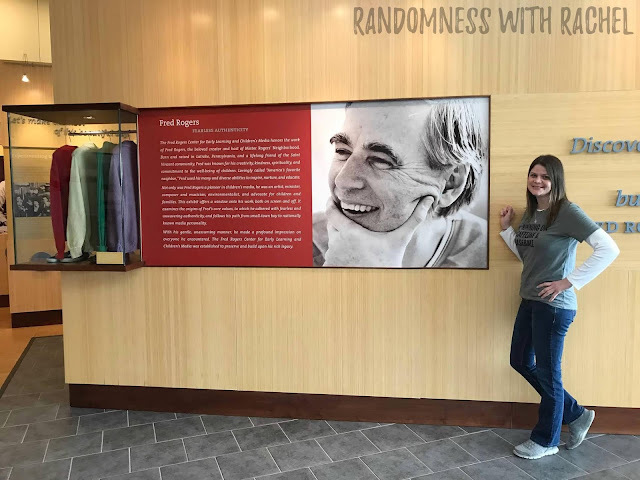 I read online that there was a Mister Rogers exhibit on the campus of Saint Vincent College, and since I'm a big fan of Mister Rogers, we had to stop by. I will not confirm or deny that I possibly teared up a little bit in the exhibit. 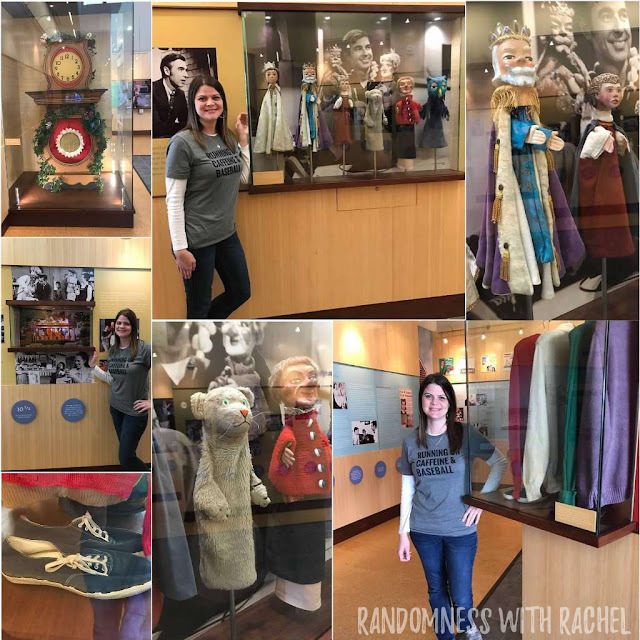 The exhibit included many items that belonged to Mister Rogers (sweaters and tennis shoes), as well as props from Mister Rogers Neighborhood. The trolley, Daniel's Clock, and many of the puppets from the Land of Make Believe were there. I will not confirm or deny that I was excited to have my photo taken by them (just humor me). 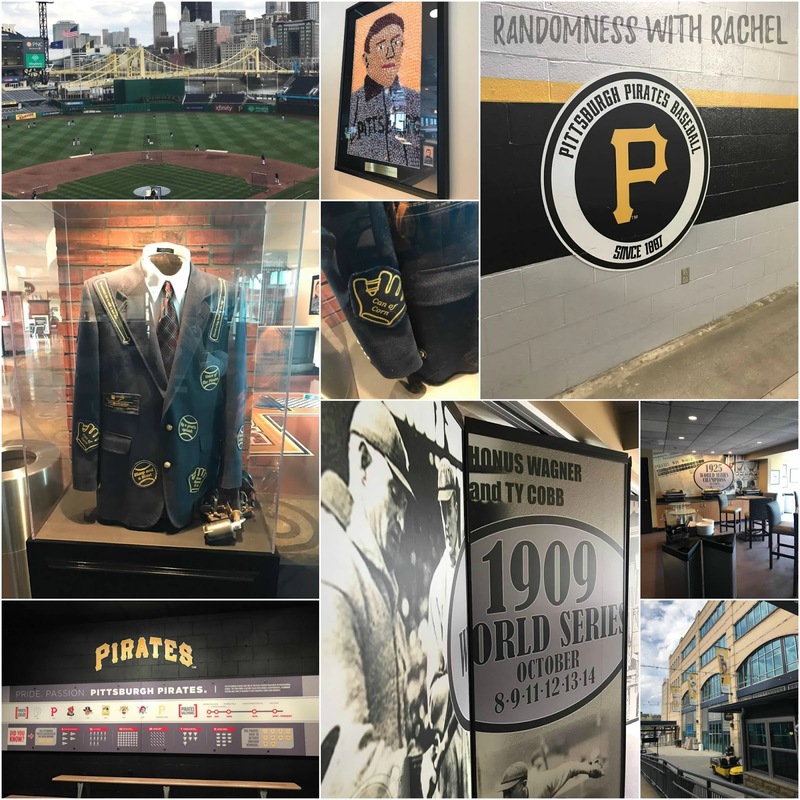 We had to hurry from Latrobe to get to Pittsburgh in time for our tour of PNC Park. I have to say that PNC Park is by far my favorite ballpark that I've visited (so far). The view was wonderful, and the history of the Pirates was fascinating. Once again, we were on a small tour, but I really like that better. The tour guides were great and so informative. We were on a "pre-game" tour, which meant we got to see the Pirates batting practice. It also meant that we were able to get the giveaway item ahead of time (instead of worrying about getting back in line). 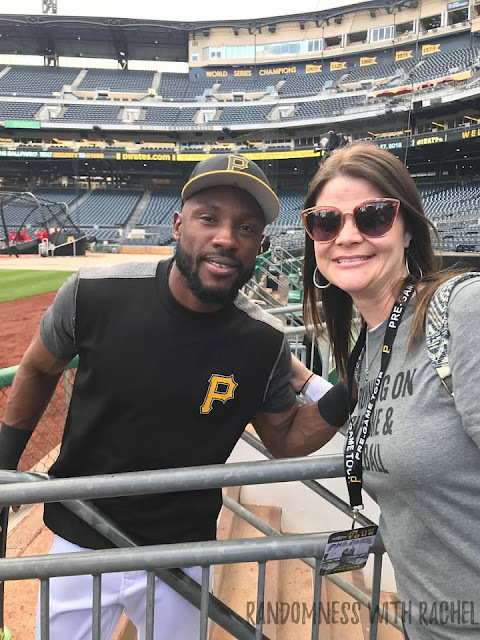 We got autographs and photos with some Pirates players after batting practice, which is always fun. I'm a big fan of getting photos and Lisa is a big fan of getting autographs, so it worked out great for both of us! 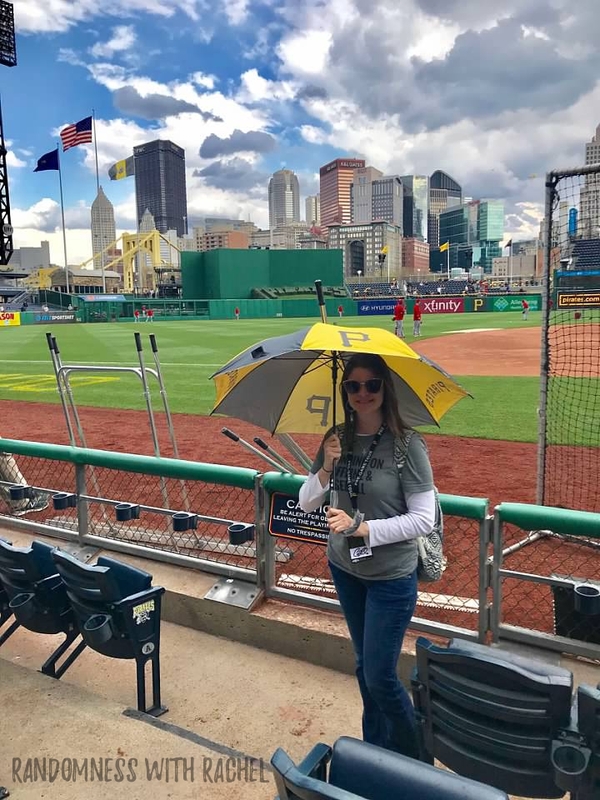 The giveaway item the night we were at the game was a Pirates umbrella. 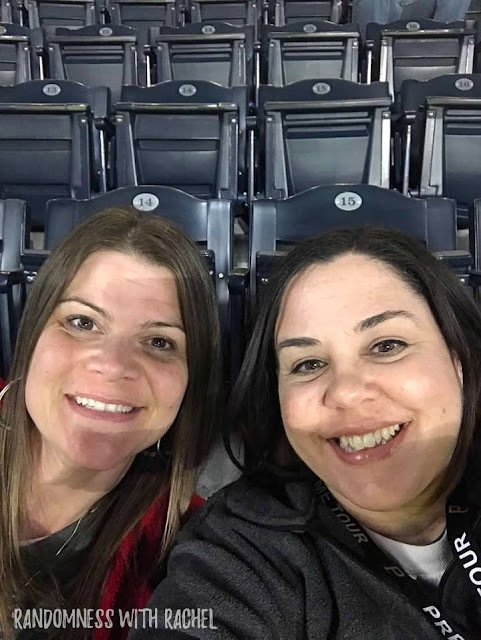 If you remember one of my trips last year, I went to Minneapolis with Lisa and our friend Michelle to a Twins game, and we got Twins "Purple Rain" umbrellas (recap here). I seem to be collecting MLB umbrellas now. Oh, remember that they gave out umbrellas at the game. This will factor in later on in my recap. 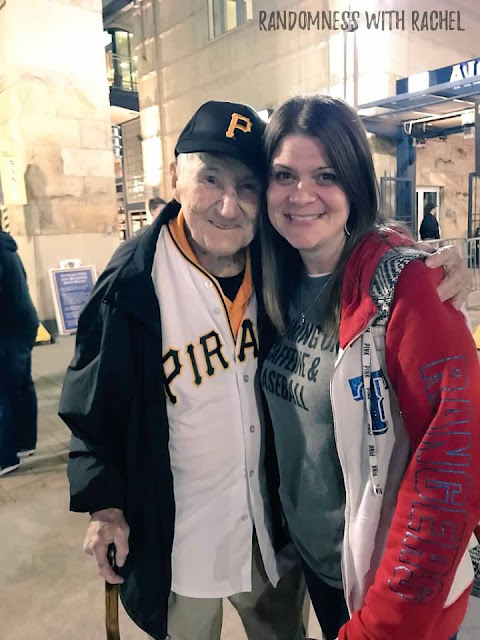 We found out during the tour that the Pirates were honoring a man named Phil Coyne before the game that night. He had been a Pirates usher for 81 years. 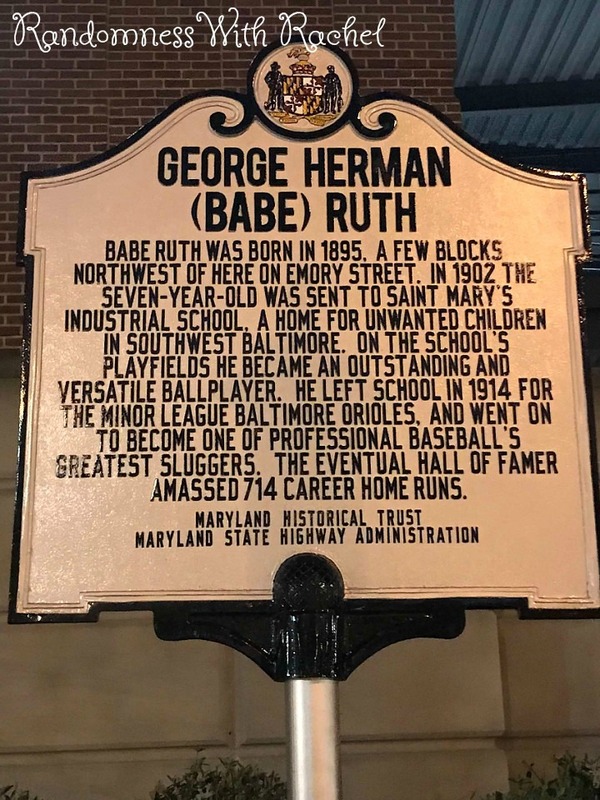 Yes, 81 years, that's not a typo. It was his 100th birthday and they were holding a ceremony in his honor. He had retired the year before. They said he probably would have worked another season, but he took a bad fall last winter, and the doctor told him not to work anymore. Anyway, until that day, we didn't know that Phil existed, but we became instant fans. 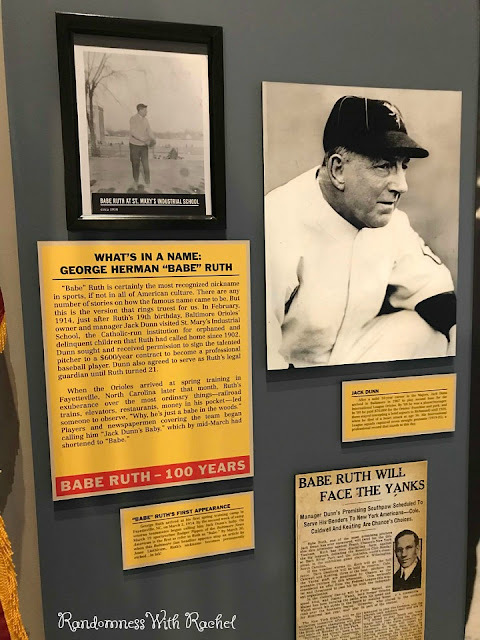 Cooperstown even sent a notice that they are going to put Phil's badge and shirt on permanent display in the Hall of Fame. He was adorable. The game was a lot of fun. 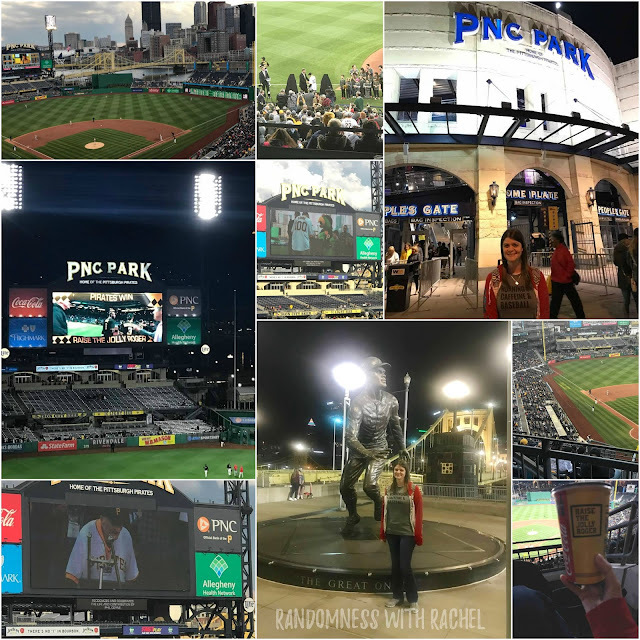 We sat in the upper deck, mainly to have a few of the skyline and Clemente Bridge. The game was fun. 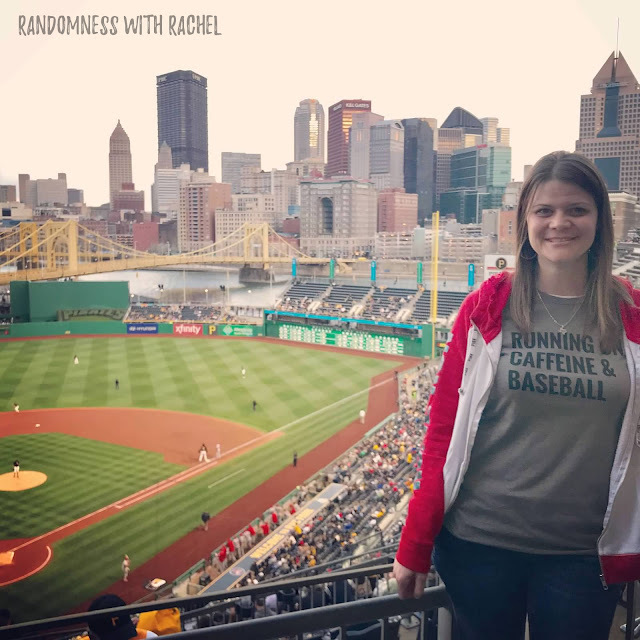 Like I said, I LOVED PNC Park. There was a group of guys sitting on the row in front of us at a "Bachelor Party". They were... interesting but they weren't annoying or rude. We enjoyed talking to them and had great conversations. Once again, we had people impressed that two females were on a baseball trip (really people, it's the 21st century- girls can like sports). Remember how we got giveaway umbrellas before the game? Well, during the game, it started to rain. Hey- that's okay, I thought. I have an umbrella to use. Less than 30 seconds after opening the umbrella, a not-so-nice usher came over and snapped at me to close it. He was like, you can't have umbrellas in the ballpark. Really dude, because the ballpark gave it to me when I came in the gate. He said that I could have it, I just couldn't open it. EVEN IF IT WAS RAINING? I asked. He said he could eject me from the ballpark just for opening it. I thought he was kidding so I laughed. He wasn't kidding. He made a point to pull out his handy-dandy usher notebook and pointed to the rule listed. Sure enough, no open umbrellas allowed. So, in all my years of attending MLB games, I'm almost ejected for opening an umbrella. Go figure. Oh well, it made for a good laugh after the fact. You would think they might have mentioned to us when they gave us the umbrella "hey, don't open it, even if it starts raining." What's really funny is that there was no one behind me, so it wasn't like I was blocking anyone's view. Ah, Pittsburgh. So, throughout the game, our new friends tried to convince us to go out with them afterward, but we politely declined. Several times. The game went to extra innings after the Pirates tied it up in the bottom of the 9th. Our new friends wimped out in the top of the 10th, but we stayed until the bottom of the 11th when the Pirates won on a walk-off hit. We got to see them Raise the Jolly Roger-which is their victory flag. I know, I wasn't sure what it meant when I first heard the phrase either. 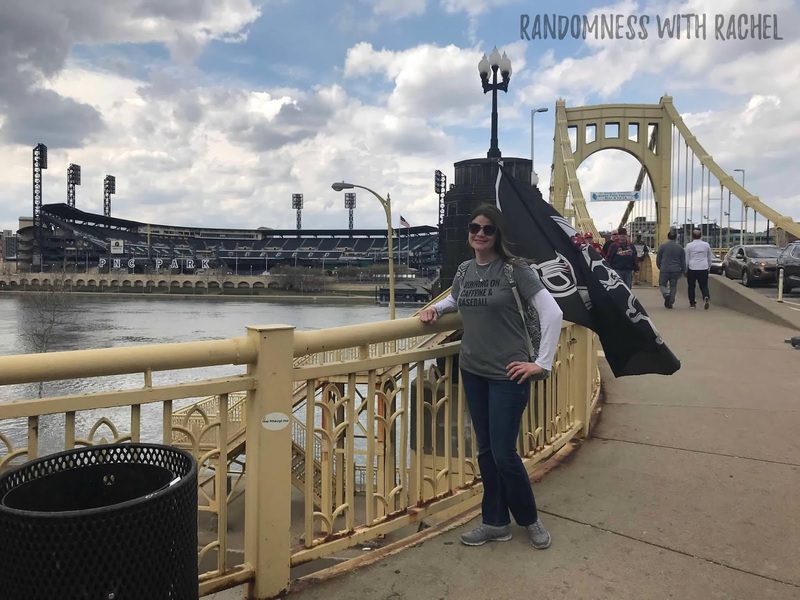 We were exhausted as we were leaving PNC Park, but it had been a great day so we didn't even care. 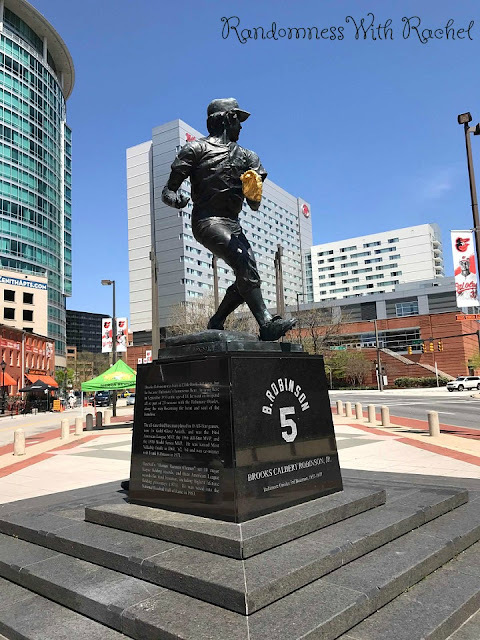 We decided to walk around and take photos of some of the statues outside the ballpark. We were in a hurry to get to our tour on time earlier that we didn't walk around the outside. We joked with each other, wondering what time Phil left (because the man is 100 years old, surely he left in like the 6th or 7th inning). We turned a corner, and who do we see waltzing out of the gate- PHIL. Looking like he had more energy than the two of us combined. I possibly grabbed Lisa's arm and mouthed "IT'S PHIL!" He was adorable and I had to have a photo with him. I went up to him and politely said hello and happy birthday. I asked if I could trouble him for a photo, and he said it was no trouble. He's obviously used to being a star. HE. WAS. A. PEACH. Me and Phil. Trip. Made. Once again we hadn't checked in to the hotel before the game, so it was well after midnight before we got to our room. Another long, exhausting day, but we didn't care. We were looking forward to day three! 4. Visit three states on my States To Visit list- WV made state #3! 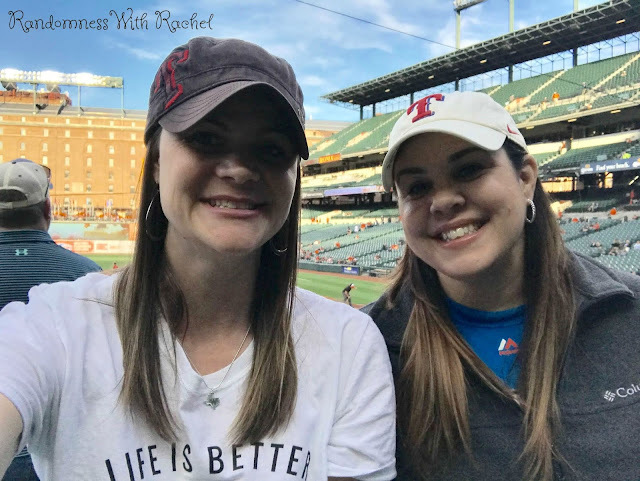 Like I mentioned last week, I took an amazing road trip with my friend Lisa back in April. This was such a last-minute-we-are-crazy-to-do-this-thrown-together trip. Have you ever had a crazy idea for a trip? Well, I did. I was texting with my friend Lisa one day and told her about my insane idea for a baseball road trip. I was trying to mark stuff off of my 40 By 40 list (which is a now a 40 THROUGH 40 list since I didn't quit finish it. Hey, it's my list, I can change the rules. I have until May 23 of next year to complete everything). :) BUT, this trip did allow me to mark off a few items before I turned 40. Anyway, when I told her my idea I expected her to just laugh at me. 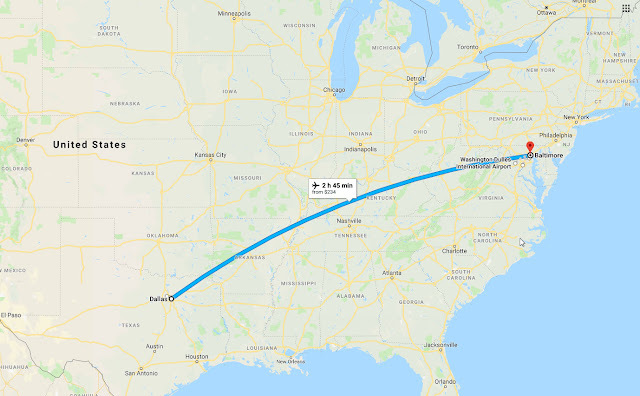 She didn't (well, she probably did), but then she said, "hey, I would totally go with you if you did this trip." I responded, "ARE YOU SERIOUS?" 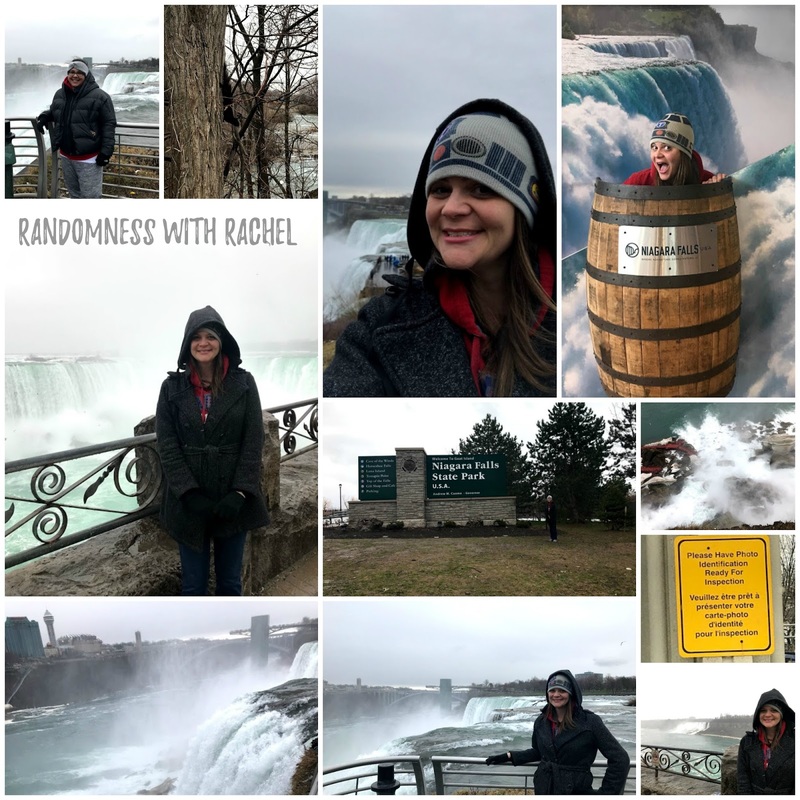 She was serious, and so, this is how my friend Lisa and I went on this AMAZING You Only Live Once road trip. The whole seven day trip is too much to put in one post, so I'm gonna divide it up. I am going to try and post MORE than once a week. I have a trip coming up in two weeks and another one in August, so you will be seeing a lot of travel posts over the next few months. Our trip started on April 26. We left Dallas super early (like 5am) and flew to Baltimore. 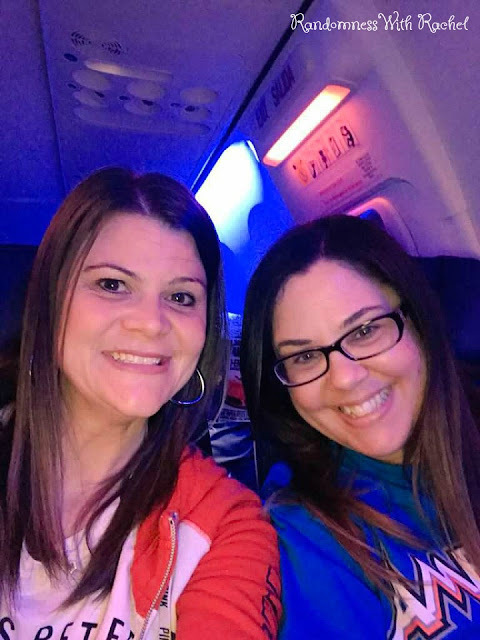 So, we booked tickets on Southwest, and our flight was the same week as that incident where the window broke during the flight and that passenger got sucked out. I was terrified to sit by the window so Lisa braved it. 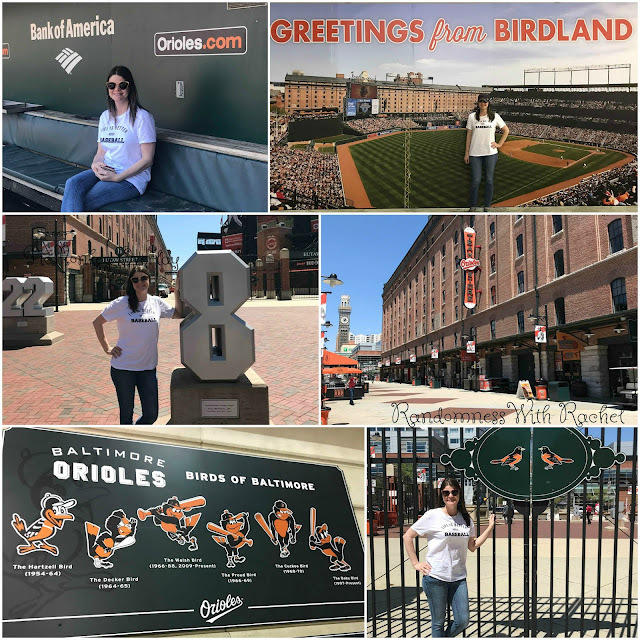 When we landed in Baltimore, we had so much to do in so little time. Originally we were going to drive to Delaware (just to say we had been to Delaware), but we changed our plans and decided not to go (which worked out for the best in the long run). 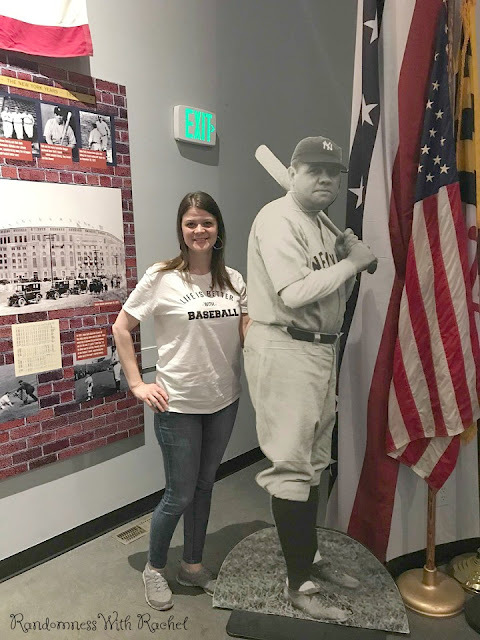 After picking up our awesome rental car (shout out to Dollar Rental Car- they were awesome and super inexpensive), we headed to the Babe Ruth Museum (which is a short walk from Camden Yards). Lisa had been there before before but didn't mind going back. 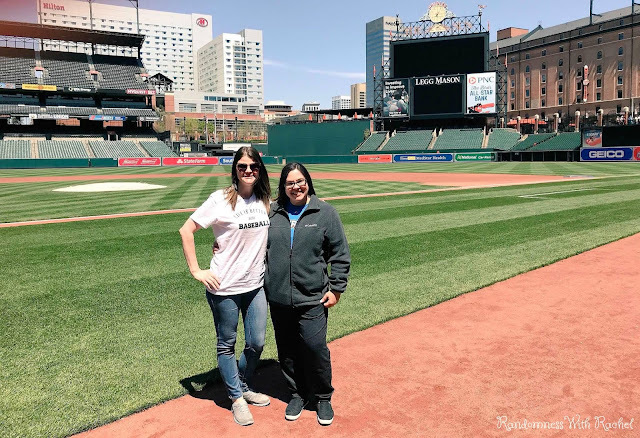 After our visit to the museum, we made our way to Camden Yards for a tour of the ballpark. 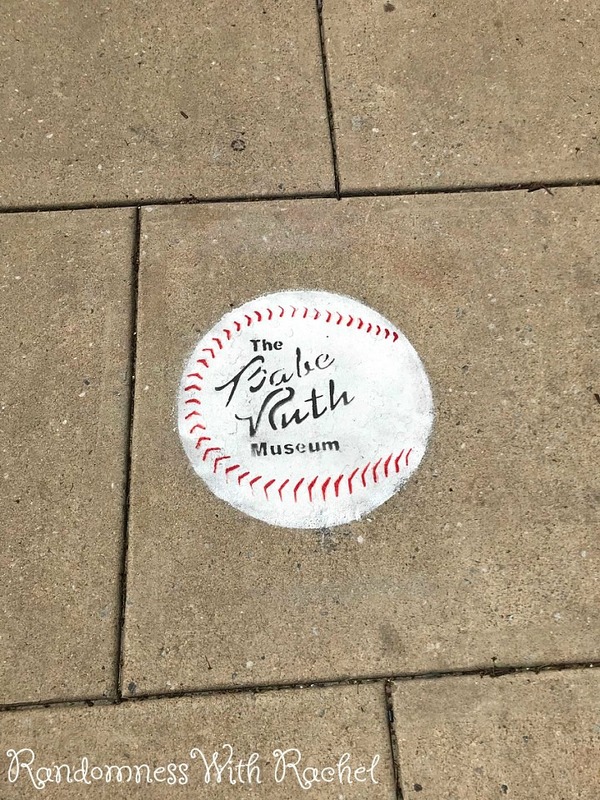 There were baseball painted on the ground between Camden and the Babe Ruth house advertising the museum. 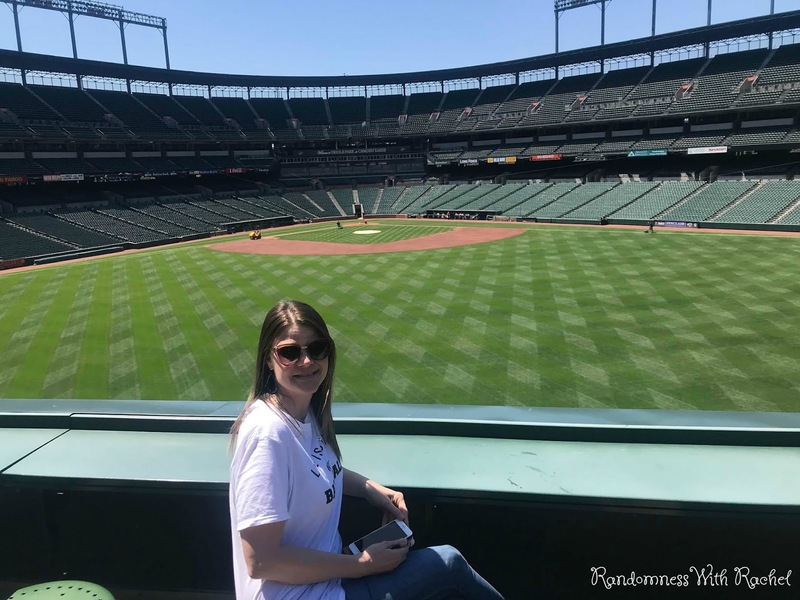 Camden Yards had been on my baseball bucket list for a long time. 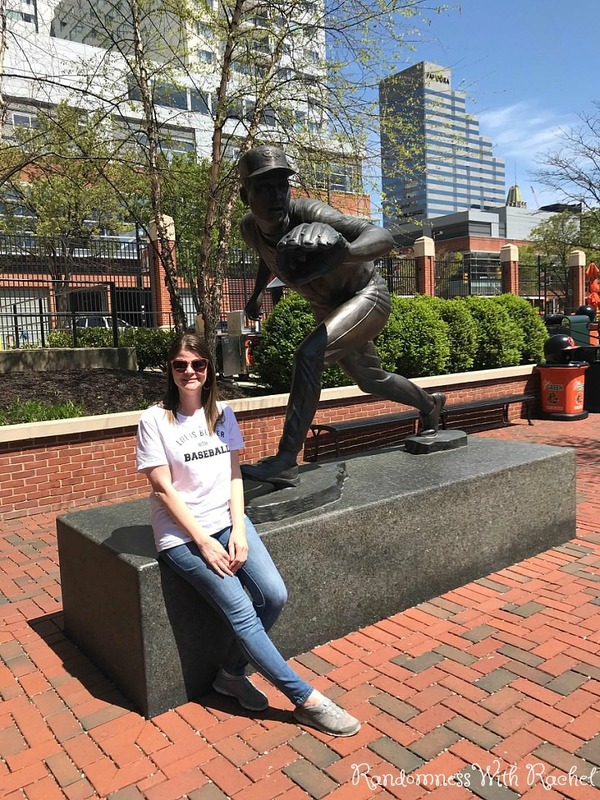 I was never a huge Orioles fan, but I grew up in the era of Cal Ripken, Jr. and I was a big fan of his (how could you not like him?) I was watching the game the night he broke Lou Gehrig's consecutive game streak (I actually skipped youth group so I could go home and watch the game on TV). I regret nothing. Lol. Our tour guide was named Ed and he was awesome. We had a small tour group, I think there were six of us. I love hearing the history of other teams, especially teams who have an older history. Since it was a game day, we couldn't go into the locker rooms, but we were allowed in the press box, the media room, on the field, and in the dugout. 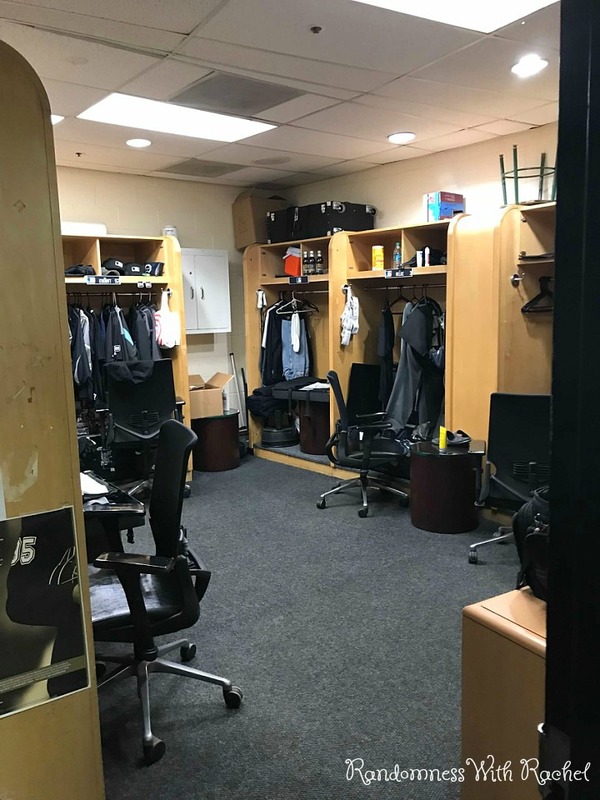 We passed by the umpires locker room and the door was open. Ed said the door was rarely open during tours, so we got to see the inside of it (we couldn't actually go in it, but we took photos from the door). It was nothing all that exciting, but still kinda cool. During the tour we made small talk with the other members of the group. When we told them we were on a baseball road trip, they seemed impressed.. We made friends with one nice man named Tim, and he followed us on Twitter so he could keep up with our adventure! 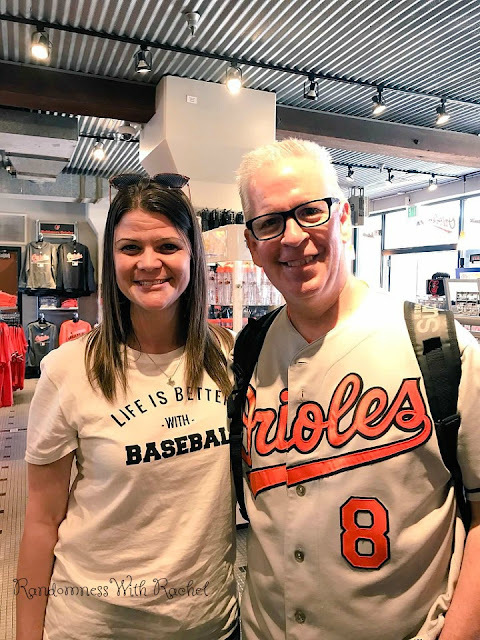 We seem to make new Twitter friends when we travel to ballparks (we made a new Twitter friend last year when we went to Minneapolis). After the tour, we decided to get something to eat and relax for a bit before the game that night (we did this instead of driving the two hour round trip to Delaware). We both had been up since about 2:30 that morning in order to get to the airport to catch our early flight. We laughed that it was only day one of a seven day trip and we had already done a lot. 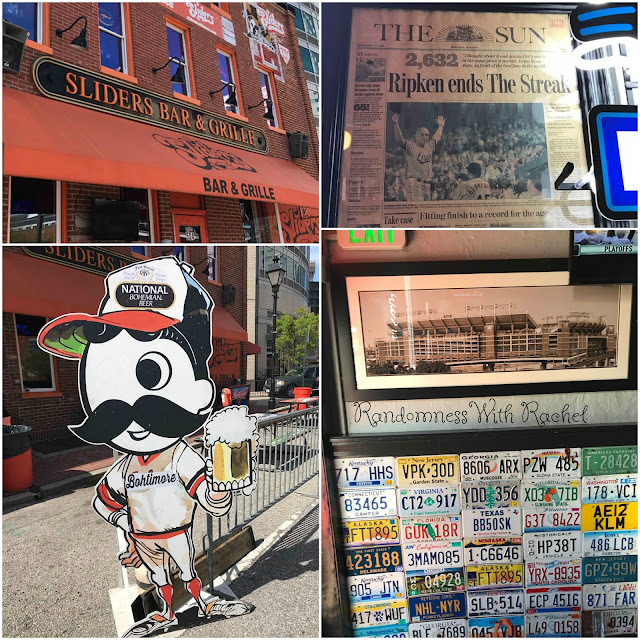 We ate at a sports bar across from Camden Yards. It wasn't anything spectacular, just regular bar food, but it was still good and it was nice to sit for a while. 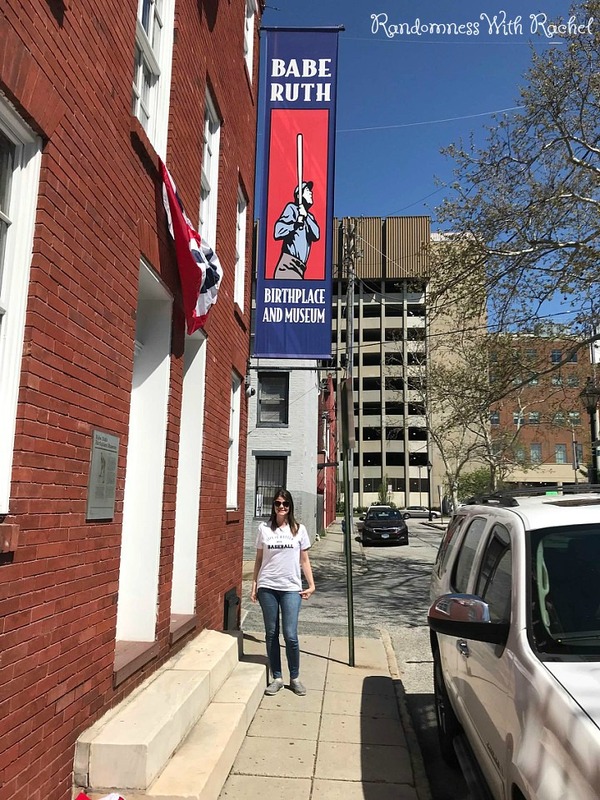 After we finished our late lunch, we thought about going to see Edgar Allan Poe's house and museum, which was a 10 minute drive from Camden. The road to the museum was under a lot of construction, and there was no real safe parking (mainly just street parking along an already narrow road that had been made even narrower). And not to sound paranoid or anything, but it didn't seem like the best area for us to park our car and walk several blocks in. Soooo, we decided to skip it. We found a street just a block over from Camden Yards to park for the game. We were about to put money in a parking meter when this man across the street called out. He said the side of the street he was parked on was free all day (it only applied to about half of a block worth of cars, but he said he parked there every day for work). We didn't see any tow away zone signs so after he left, we moved the car over there. And, spoiler alert, our car was there and un-ticketed when we returned after the game. Hooray for free parking! 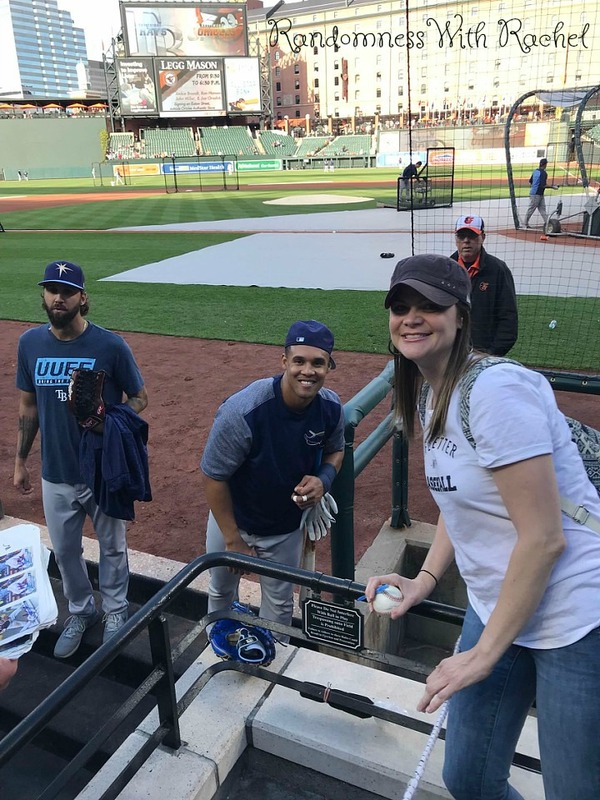 We were able to see some of batting practice. 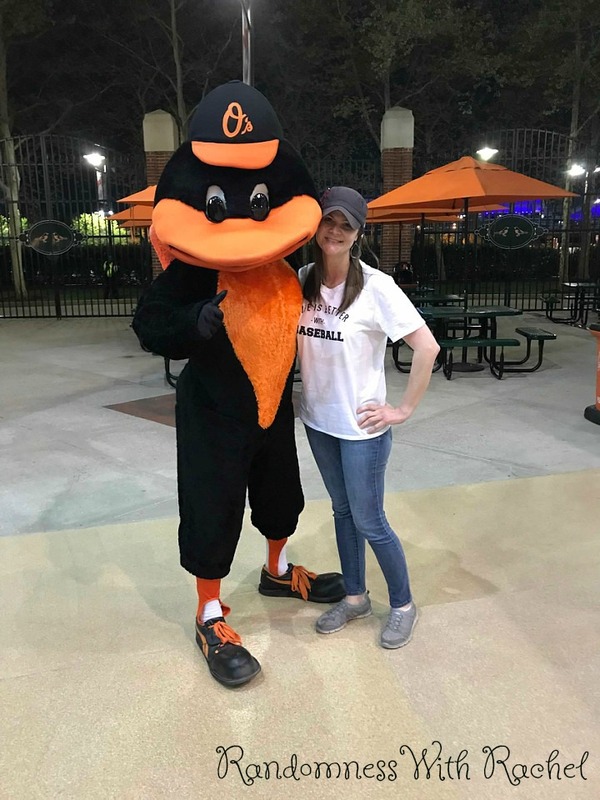 The Orioles were playing the Tampa Bay Rays that night. Fun fact: We would see the Rays play again on our trip when we were in Detroit. Carlos Gomez is a former Rangers player and he's now with Tampa Bay. 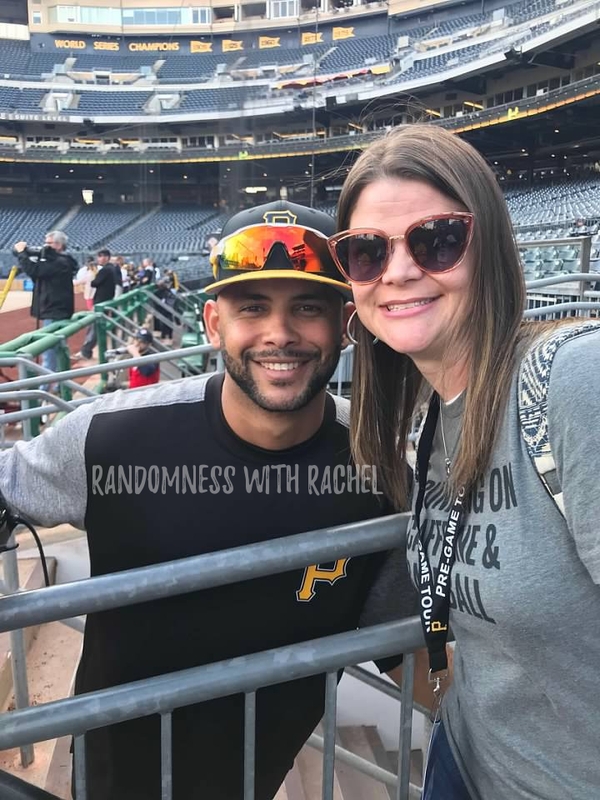 We were hoping to get his autograph (well, Lisa wanted the autograph, I always opt for a photo instead). The usher wasn't letting people too close to the field, we had to stand several rows back. When Gomez made his way into the dugout we called out at him and said we were Rangers fans and that we missed him. He smiled and motioned for us to come down. The usher had to let us down at that point since Gomez told him it was okay. Gomez was nice enough to sign and take this quick photo with me. After batting practice, we went off to get food, our souvenir cups, and my magnet from the gift shop. We found good seats on StubHub for a VERY cheap price (it was to our benefit that the Orioles are not playing well this season so tickets sell for very cheap). Everyone we came in contact with was super nice. We found this to be true at every ballpark on our trip. 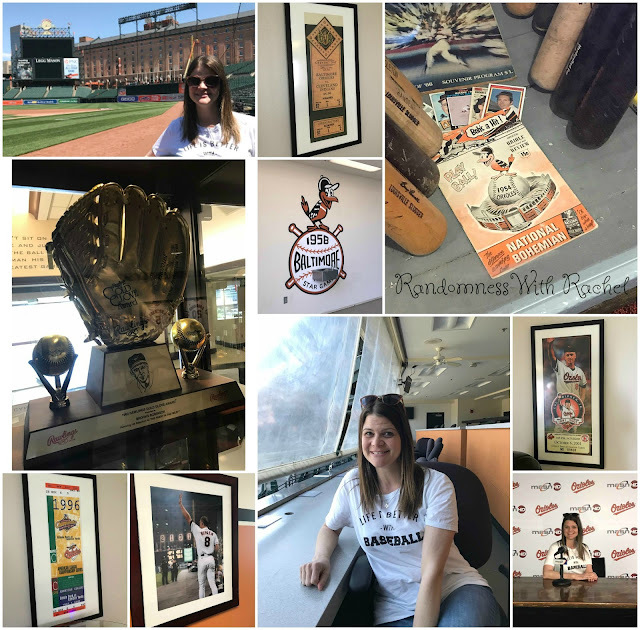 The employees, the Orioles fans, the non Orioles fan- everyone was just a joy to be around. It was nice to see, especially in a time where there seems to be not a lot of nice people out there. I would like to point out that the Orioles provide both a lid AND A STRAW with their souvenir cups. It's something that I wish the Rangers did, but alas, they don't. Also, our souvenir cups are trash next to other stadiums. Step it up Rangers. They had a What-a-dog, but no What-a-burger. So, by the time we left the game, it was about 11pm EST. We both had been up since 2:30am CST. 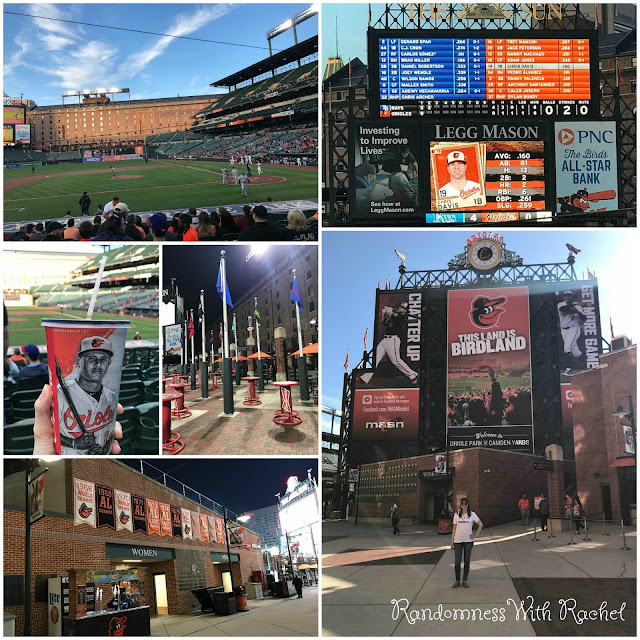 We still hadn't checked into our hotel (which was about a 25 minute car ride from Camden Yards). We finally got to our hotel room a little before midnight. We knew we had a lot to see the next day, so we had to set our alarms for 5:45am. We don't go on vacation to sleep (we averaged 5-6 hours of sleep each night of our trip). BUT, our first day was a success. Yes, that was only THE FIRST DAY. 19. Pay off all of my credit cards. This one was HUGE!!! I paid off my last credit card right before I took this trip. I can't tell you how nice it is to not have any credit card debt. Thanks for reading. If you stuck around to the very end, you are AMAZING! !